What a great concert. Jackson Browne complained about having a cold. He rocked the place. We had never heard of him. Joni was great as usual. A magical evening. I was at this as well. I remember that Jackson Browne had trouble keeping his Martin in tune and eventually wound up just playing piano! 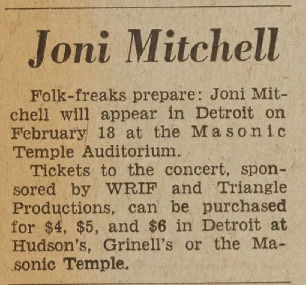 But the highlight for me was Joni's preview of Cold Blue Steel and Sweet Fire from her upcoming album, which turned out to be For the Roses. Hearing that for the first time live was pretty special. I was at this concert. The Masonic Theater is a fabulous venue. 4500 seats or so and acoustically perfect. An unknown singer/songwriter by the name of Jackson Browne opened for her. It was such a magical evening. 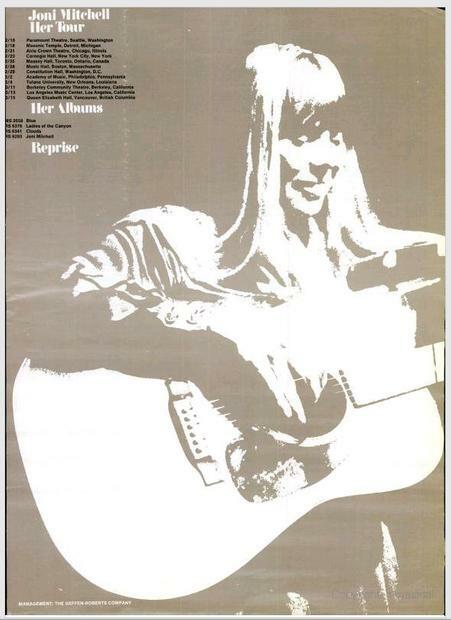 I was young in those days and fell in love with Joni's music. A love that I have to this day.